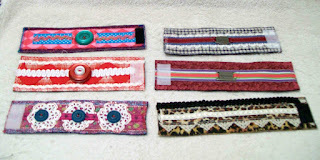 When I started on this set of lace and ribbon wrist cuffs, I envisioned Frou Frou. Layer upon layer of enticing lace. WRONG. I tried, but find all I accomplish is spending huge amounts of time evaluating this and that and not creating a darn thing. In fact, with this set, I'm learning that I'm most creative if I make almost no plan at all. It's just not good to overthink things. Just pick up a piece of ribbon or lace, lay it here, grab something and place it there, etc. Here's another 6 between yesterday and today. There's actually a couple more that are buried somewhere in the huge pile of ribbons. One did not turn out well and was scratched. These are coming out as small fabric collages. I'm using fusible web between the felt and the fabric as I think it gives the cuff a little more stability. Low productivity days ... the internet quit working and must have spent 3 hours yesterday working with BellSouth trying to get it figured out. Apparently, it ended up being some type of problem outside the house and an unknown person came here today (didn't see him/her) and fixed it. Then, they upgraded the service and some settings had to be changed, which I apparently incorrectly answered because the the router quit working ... and, one thing led to another it's been quite an uproductive time. Alas .. tomorrows not sounding much better as I promised Beau I'd help with yard work ... Alas.